Before sharing how we came to record the Divine Mercy Chaplet, we must share how the Lord drew us to the Catholic Church. First though, a brief background would be useful. I came to know Jesus as Lord and Saviour in 1994 through an Evangelical ministry bible study conducted by Christian Business Ministries Committee (my testimony can be found at www.surrender.ca). I quickly recognized that not only was I ill prepared to live a Godly life without some serious discipleship, but I also had no clue what it meant to be a Godly husband. For the next five years I immersed myself in the Word of God and became quite involved with various ministries. In 1999, I felt a leading to pray for a wife and went on Christian Matchmaker.com (it is no longer operating) and met Angelina who was living with her daughter in London, Ontario at the time. She was working as a business manager at a car dealership and was very ready to get married. She had had much exposure to Christianity but had not experienced true conversion as of yet. When we met it was evident that her heart was well prepared to fall in love with Jesus. We were married in my backyard in Ottawa in July 1999 and our adventure as a couple began. I recall encouraging her to spend time getting to know the Lord by reading His Word. She had been so conditioned by the world to work and strive for success that she asked me if I was sure it was OK to spend hours with the Lord and not working! After assuring her that the Lord would be well pleased, she began her journey and grew and matured in Him very quickly. In 2001 we were operating a Christian Retreat called Abundant Blessings in the foothills of the Laurentian Mountains in Val des Bois, Quebec, Canada. Angelina had established a prayer closet, a "secret place" in one of the bedrooms to meet with our Lord and spend time in His Presence. Also, at this time I was licensed as a pastor with CFCM (Canadian Fellowship of Churches and Ministries). Through word of mouth many people came and were refreshed by spending time in worship, bible study and alone in His presence. We were thrilled to be part of this hidden work of the Lord. Of course, Quebec's very Catholic heritage was all around us including a beautiful Grotto on our property which I had covered with a white cross signifying that Mary was behind Jesus 100%. I thought this strategy would appease both Catholics and Protestants. In the fall of 2001 my very close and dear friend Hugh (www.catholicbridge.com) asked if I would play bass for him in a Polish Catholic church in Toronto. Up until that point we had ministered many times together and I thought it was a show of unity between Catholic and Evangelical brothers. This time however was different as this opportunity was actually in a Catholic church. The last time I had ministered in a Catholic church was many years before with worship leader Marcel Dion. It was an Easter mass and I thought it would be my last. I had been given a defamatory documentary movie about the Catholic Church by a well meaning Evangelical brother and had made a decision to completely leave the Catholic Church. As I expressed to Dave my doctrinal difficulties with the Catholic perspective on different issues, he began to send me lengthy apologetic emails defending the Catholic church. I sometimes wondered how he was making the time to do this! We now know he also was praying and had others praying for us including Father Brian Christie (this whole process was the impetus for Dave's Evangelical friendly Catholic website www.Catholicbridge.com). One of the main doctrinal disputes was the real presence of Christ in the Eucharist. This made me particularly uneasy as I was celebrating it symbolically as a pastor. Angelina and I went into the prayer closet and prayed a simple prayer. "Lord, we do not want to miss out on anything you have for your children." I was intellectually confused and added one more prayer which I did not share with Angelina. I said to the Lord, "please show me through my wife if you are really present." Now it is important at this point to share that when the Lord really wants to get Angelina's attention, he will bring her to tears. This has happened on numerous occasions when he wants her to pray for someone for healing. Well, as we began to go to the odd mass something beautiful started to happen. When anyone would go to the tabernacle to bring our Lord to the altar and at times of consecration, Angelina would begin to weep. The Lord was now clearly showing both of us that He was truly present, Body, Blood, Soul and Divinity! We knew that we had to commune with Him this way. I had to humbly recognize that in my religious zeal, I was wrong about many things. Angelina and I both filed for annulments and two years later were finally granted them. On October 5, 2004 (St. Faustina's feast day), Father Bob Bedard blessed our marriage at St. Mary's Catholic Church in Ottawa and we finally received the Lord as a newly blessed Catholic couple! It was awesome! It was amazing! The Lord by His mercy and grace had brought us home to the Catholic Church! Now about the Chaplet. 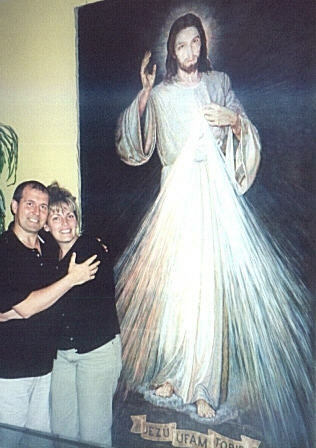 We were lent the above painting for a time in 2003 and began to pray the Chaplet in front of it. I would have my guitar and would be playing some background music. Angelina started to come up with melodies and over a period of a couple of months our version was birthed. It is a wonderful devotion to spread and we encourage all who are led to find out more and do so. If you order our CD, there are also a number of tracks where Angelina shares from the Diary of St. Faustina.